The Honolulu Academy of Arts in Honolulu is a cultural smorgasbord. The museum is home to a permanent collection of art from around the world and much more. The Doris Duke Theater screens independent and international films. The open air Pavilion Cafe serves a fusion lunch menu featuring local ingredients amid a tranquil garden. 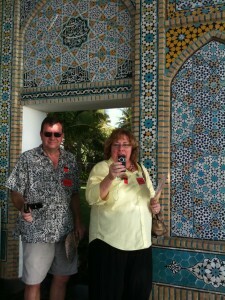 Your tour of Shangra La, Doris Duke’s home with a collection of Islamic art, begins and ends at the museum. One of my favorite areas is the peaceful Chinese Courtyard with the brilliant lotus blossoms poking out from the azure pond, guarded by stone dragons. 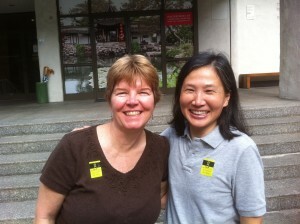 Ji Sun Chang suggested we visit the museum for a special exhibit. On display November 03, 2011 – January 08, 2012 are 56 paintings from the Palace Museum also known as the Forbidden City along with items from the Honolulu Academy of Arts collection. This is the first time these 13-14 century works of art have traveled outside China. Collections Registrar Pauline Sugino traveled to Beijing to bring this collection to Hawaii. The exhibit titled “Masterpieces of Landscape Painting from the Forbidden City” features works by influential artists of the Yuan dynasty (1279-1368) Huang Gongwang, Wu Zhen, Ni Zan, and Wang Meng. These pieces feature several distinct styles of brush strokes and use of color. The works of these four masters influenced artists of the Yuan dynasty. I was amazed at how well these paintings have been maintained. Despite their age, they are in excellent condition. Entrances to the exhibit and round doorways between rooms are designed to transform visitors to ancient China. Note the garden scene above as we enter and round doorways inside. QR codes posted next to the landscapes link to podcasts with more information about specific works and artists. Click on the image below to see the introductory episode. Shangri La, the Pacific oceanfront private home once owned by socialite Doris Duke is now open for tours through the Honolulu Academy of Arts. Built in 1937, the custom design sits on a large estate overlooking a rocky beach near Diamond Head crater. 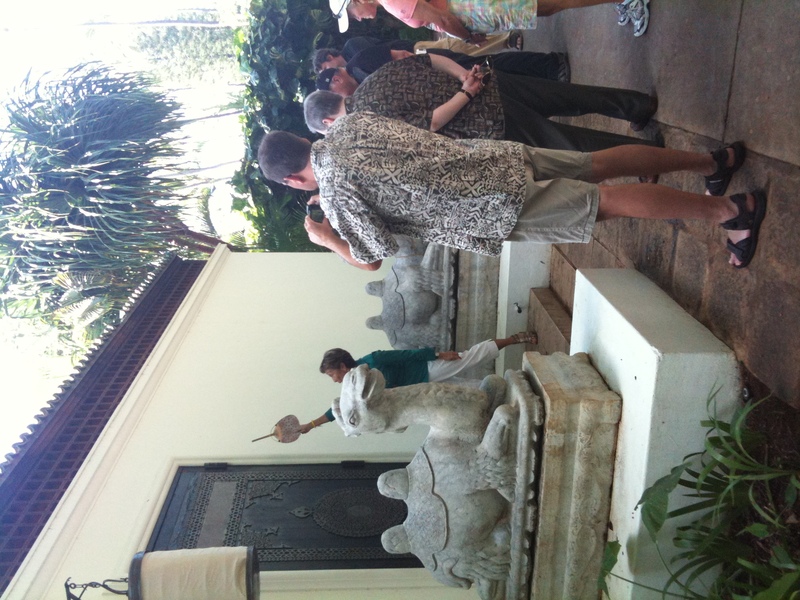 Tours begin and end at the Honolulu Academy of Arts and guests are transported to Black Point beach on a motor coach bus. A guide meets you at the gate with an introduction about the property and overview of the rules for your visit. The first rule is not photography is allowed within the walls of the complex. Photographs are available for purchase at the museum gift shop. No photos are included with the $26 per person entrance fee. Doris Duke came into money as a young girl. She married and after traveling around the world, purchased 5 acres just outside Waikiki for a part time residence. Duke was involved in the intimate details of building the home creating a showplace for her growing collection of Islamic art from places she had visited. 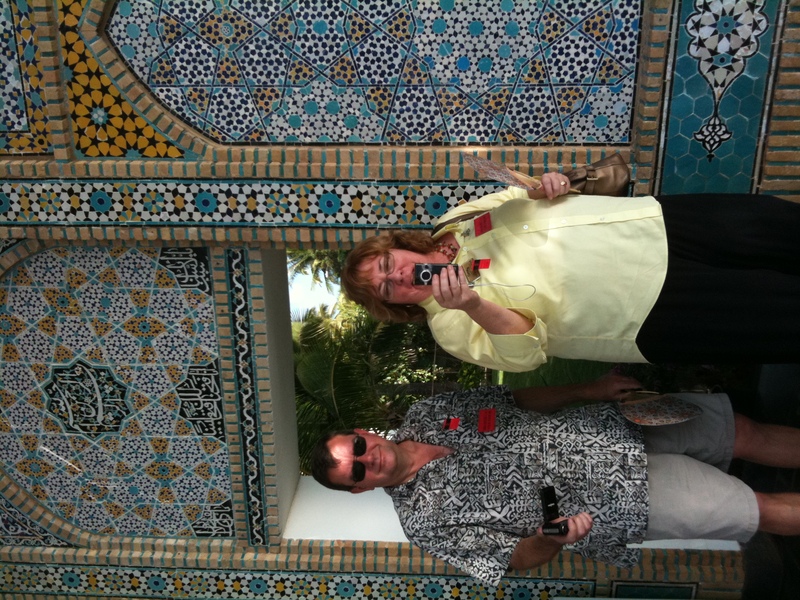 Persian carpets, mosaic fountains and ancient pottery quickly filled the large rooms. The cavernous living room is surrounded by floor to ceiling windows with a spectacular view of the garden, pool and Pacific Ocean. The windows can be lowered into the floor with a flip of a switch allowing walkout access and trade winds to blow throughout the home. Our guide said, “Miss Duke would only lower the windows halfway to keep her menagerie of dogs inside the house. 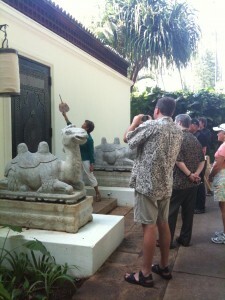 The center courtyard is lined with plants and century old Asian vases with a center skylight. 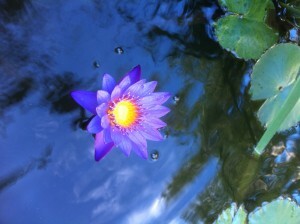 Tickets to Shangri La can be purchased throughout the Honolulu Academy of Arts and include admission to the museum. Learn more about Doris Duke’s art collection in this book.